Change is rarely easy, especially when a habit has been formed. Just think about how difficult, stressful, and even annoying it can be when someone asks to change your morning routine or you are forced to change it. That is just one person. So imagine the challenges of trying to implement a change management process in an organization, where all people have different responses to change and ways of coping with it. Unfortunately, change at many organizations does not go as planned. Some attempts may even end in failure. In a recent change management survey conducted by Towers Watson, researchers found that while 55% of employers felt that change was initially successful, only 25% felt that the changes were long lasting. In other studies it was found that 83% of CEOs believe change is their biggest challenge, while 28% of CEOs were fired because of ineffective change management. We would also add to that list of reasons one that probably has implications for all of them: Neuroscience. 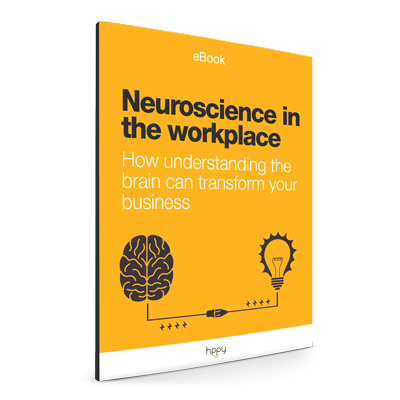 When thinking about neuroscience for business we need to first start with the brain. The brain has evolved to create pathways in the brain that respond to and activate habits. Due to these automatic pathways, there can be some resistance to change. When faced with something new our brains immediately compare it with things we are familiar with. In general, it takes much more time and energy to try something new than it does to do something habitual. In an effort to save energy, our brains will usually default to a thing that is most automatic, the habit. For example, if you have learned how to ride a bike as a child, it is probably almost second nature to you as an adult. Even if you do not ride a bike for years, you would be able to get back on a bike and ride with few, if any, issues. About a year ago, a YouTuber named Destin decided to try to ride a bike that had the controls reversed. When the handle bars were moved in one direction, the wheels moved in the opposite direction. While this seems like a pretty simple adjustment, the bike riding pathway in the brain is so engrained and automatic that it took him 8 months to retrain his brain to ride a bike. If it took 8 months of riding every day to change the pathways in the brain related to riding a bike, just imagine what it would take to change the habits of all the people in an organization. 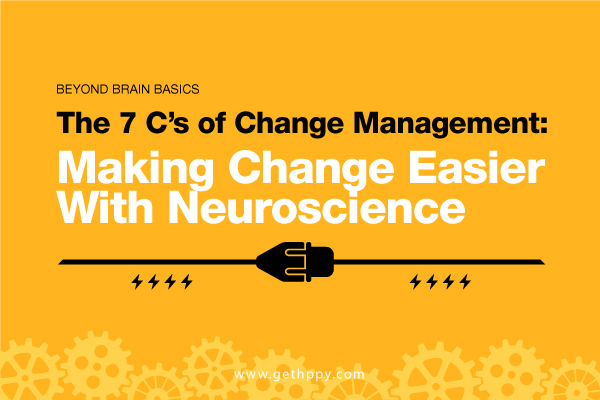 Not only is change difficult due to pathways in the brain, but also because the brain often interprets change as a threat. This perception can activate fear and anxiety, along with the fight or flight response. The fight or flight response causes us to flee from the threat or fight against it. In the case of change, the response and the negative emotions that our brains trigger often limit our openness to new ideas and hinder our decision making skills. These responses are often unconscious, beyond our awareness. Our amygdala and limbic system take control, limiting the oversight of our prefrontal cortex. We may resist change without even realizing why. It is important for leaders to present a potential change without urgency or threats in order for people to be able to accept it. While the brain processes the information about change and whether or not it is a threat, people often go through four stages of change. Employees may deny that a change needs to take place and may try to prove that the old way of doing things is better. In this stage employees start to complain about the changes and blame others. After realizing change is inevitable, employees may try to offer their own solutions or think of a better result for themselves or their team. After some struggle, employees will accept the change and participate in the change process. When looking at change through a neuroscience lens it is important to consider how habits form and how our brains react when habits change. When going through the change process everything needs to be made clear. To reduce status threat, the roles of managers and leaders need to be made clear. Goals for change also need to be clear. Vague goals can add to the already existing anxiety, as an employee many not know when they have reached the goal or how they will be evaluated on their progress. This means goals need to be specific and measurable. Companies that review goals often and have employees write down their goals are about three times more likely to be . Both the company’s goals and an employee’s personal goals can be made public so that everyone can be held accountable. For effective learning, and change, this process needs to be continuous. That means that change does not stop when it is put in place. Companies need to plan for the next change and get feedback about the previous change. The brain often needs time to process new information as much of it is forgotten soon after it is received. If the information is reviewed a couple days after, retention is much higher. Trainings, when a new change is being instituted, need to be spread out and evaluated on a continuous basis in order to maximize their benefits. Leaders need to express certainty that change will occur and certainty that the company will continue to succeed. Information about these facts should be shared with employees as often as possible to reassure them that their jobs are safe. This feeling of safety and assurance will lower the threat alarm in the brain. Communication and the feeling of safety will keep employees engaged throughout the change process, increasing its chance of success. Like in the bike example above, change requires consistency. There are some theories that it takes one month to form a new habit, but there is no research that states that. Change comes easier when it is done consistently and in small doses. A leader may want to make big changes in the company, but if they try to go for the end goal at first, the change may be too complex. Leaders need to make changes that are so small that they are easy to accomplish and become habits fairly quickly. If leaders want to institute a change where employees have to interact and post content in an online forum at least three times a day, it may be unreasonable to expect all employees to make the change by stating it in that way. To break the task down into smaller pieces, have employees log in once a day, then read a post once a day, then create a post once a day, and so on until the end goal is reached. Because the brain is a social organ, people can find comfort in their relationships with others. Leaders can provide extra opportunities for employees to nurture teams and groups formed at work. Leaders can also work with employees to involve them in the change. Employees are much more likely to adapt if they feel they are part of the decision making process. Many people may feel out of control when the company is changing. They may feel helpless. This feeling can cause increases in anxiety and depression. To counteract these feelings, leaders need to instill confidence in their employees. They need to show them that they are still in control and have choices to make. Communication is key when it comes to change. Employees want to feel that they have a voice and that it is being heard. Allow employees to complain, share opinions, and be a part of the change as much as possible for it to be successful. Leaders need to show empathy during a stressful time and connect to employees on an emotional level. This communication can be in the form of surveys, feedback sessions, or individual reviews. Change may not be easy, and it may take some time, but successful, long lasting change needs to be done with the brain in mind. And most times, the brain does not work as quickly as we want it to.